Bring the spirit of Vegas to your home game room by turning any table into a Pai Gow Poker Table with this casino style Pai Gow Poker Felt Layout cloth. This layout is printed in white and gold directly on the green table felt spots for your highest card, 2nd highest card, and your bet. This Pai Gow Poker Table cover has a smooth and consistent playing surface just like in the casinos. 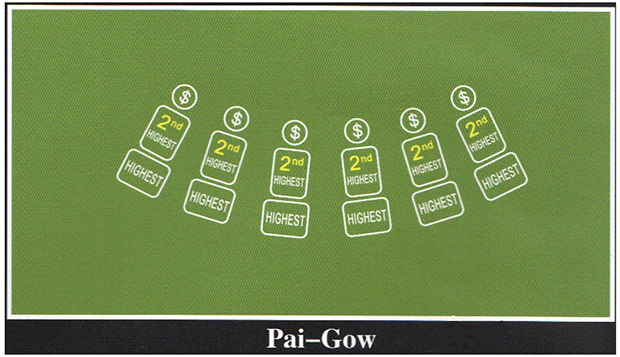 With this Pai Gow Poker layout cloth, recreate the winning feeling outside the casino - now all you need is a table, some chips and a banker...good luck!